It’s grand being a collector of the arcane. Gathering relics and artifacts from various worlds and planes of existence, painstakingly hunting them down one by one until the collection is finally complete. One should be careful though for the arcane objects are hardly governed by the same rules as the normal ones and tend to have a mind of their own. 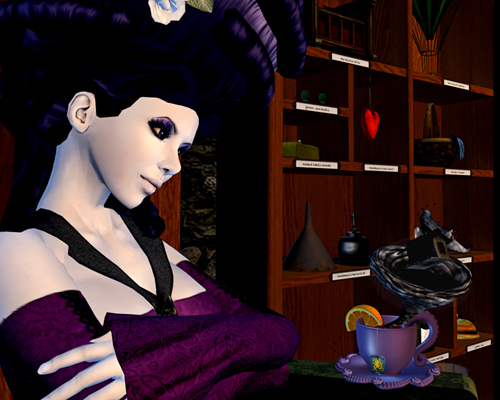 A rewarding tea time might turn into puzzlement as there is suddenly a storm in the teacup. Especially since it comes with a tiny house. At the point when magical critters hijack your miniature hot air balloon and begin floating into the sunset — alright, toward the closest window — it’s time to consider changing your profession. The Arcade has opened its doors once more, catering to all the collectors and gacha-holists of the grid. HANDverk has two separate gachas at the event, both themed around Oz. The items can be placed in the display case that is one of the prizes, but most of them also come with wearable versions: the silver slippers, golden cap, green spectacles, Woodman’s hat, Dorothy’s basket, wicked witch’s whistle and Woodman’s new heart. The throne comes in both display and furniture size. The other items won from The Arcade include the skin by Pink Fuel, hair by Curio Obscura, the tako tea cup by Schadenfreude and the little sheep critter by D-LAB. The makeup by Adore&Abhor is from the Lavender Hill Hunt. 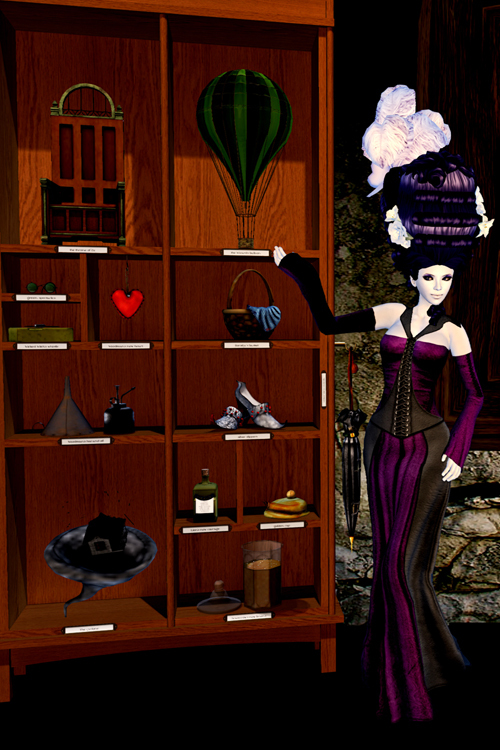 This entry was posted in Events, Fantasy, iheartslFeed and tagged Adore&Abhor, aDORKable Poses, Curio Obscura, D-Lab, HopScotch, IKON, Oz, Pink Fuel, Redgrave, Schadenfreude, The Arcade, The Muses, Z-Boutique, [HANDverk]. Bookmark the permalink.